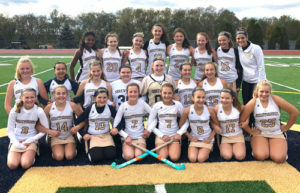 Shrewsbury – Seventh- and eighth-grade girls who attend Oak Middle School had a new opportunity in competitive sport this fall. Jay Costa, athletic director at Shrewsbury High School, expanded the athletic program at the school by adding girls’ field hockey. The team finished its inaugural season undefeated. “I came into the program wanting to have a positive impact on the girls and also play at a level that would lead them to success at the higher levels. This team always had fun but more importantly they all wanted to learn and they got along with each other. This team just clicked,” Flannery noted. She said that she could not have asked for a better group of girls for her first year as a coach. They taught her as much as she hopes she taught them. Flannery, who is from Boxborough, comes with at least 10 years of playing experience starting with her high school team, the Acton-Boxborough Colonials, and then in college at Washington and Jefferson College and Bridgewater State University. She currently lives in Worcester and works full time for Franklin Professional Associates (a recruiting and staffing firm) as a recruiter. Flannery said that she and Costa shared the same vision of what is needed to build a successful program.